Its been one of those very up and down days. As a habitual grumpy sod my day was lifted, much against my better judgement, by the visit of my favourite hitch hikers. A trip through the Glory Hole and into the Brayford Pool and back was all it took to get thoughts onto a more reasonable level. But at the back of ones mind is “Do I sleep tonight” I doubt it. I can understand why some people after being burgled go some what over the top and make sure that people like that rue the day they ever set eyes on a narrowboat. Where are the Guinness Book of Records when you need them. 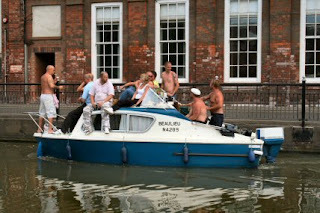 We all know how many people you can get into a mini but what is the number for a small powered boat? I don’t know but this must be nudging the record. I was nearly taken over by them as they reckoned they were the Beer Police and if I didn’t have the requisite cans I would have to bribe them with. They took pity and moved on in a fine state of mind.